Ironically, the headline ran while the casket of George H. W. Bush, a man considered by many to be the most qualified president in modern times, was lying in the Capitol rotunda receiving accolades for his extensive pre-presidential resume. In our modern culture, national heroes and role models have virtually disappeared because no human can stand up to the 24/7 media scrutiny and still stay on top. However, that hero-worship vacuum has been filled by celebrities and those “famous for being famous.” But celebrity status also comes with its own special curse. Researchers have determined that due to the constant use of screen technology, human attention spans have grown shorter. This phenomenon also translates into our culture’s continuous need for rising-star celebrities and fresh-faced candidates. Biden, the antithesis of a fresh face, is indeed the “most qualified” and leads the 2020 horserace for the Democratic presidential nomination. Most likely that is due to name recognition after decades in the Senate, two prior attempts at a White House run, and eight-years as Vice President. As a 76-year-old white male, if Biden manages to win the nomination of his party that demographically looks increasingly less like him, his would be an inspiring senior-citizen political come-back story. Now, after the midterm election and Democrats gearing up for the 2020 presidential cycle with mini-buses full of candidates but no real leader — two new fresh faces have emerged to fill the celebrity void -- Beto O-Rourke, and Andrew Gillum. Ironically, that “fresh face” from 2008, is now a 57-year-old former two-term president, who appears to have assumed the kingmaker, kiss-my-ring role for the party’s next nominee. Enter Beto O’Rourke into the king’s court. "The meeting, which was held Nov. 16 at the former president’s offices in Foggy Bottom, came as former Obama aides have encouraged the Democratic House member to run, seeing him as capable of the same kind of inspirational campaign that caught fire in the 2008 presidential election." And it all makes perfect sense. Beto, an attractive man with an unusual name, and an avowed liberal, who after six years in Congress nearly won a very high-profile race, is seen by Team Obama as potentially, the “new Obama.” Of course, the 800-lb gorilla in the room is Texas’ 38 electoral votes. 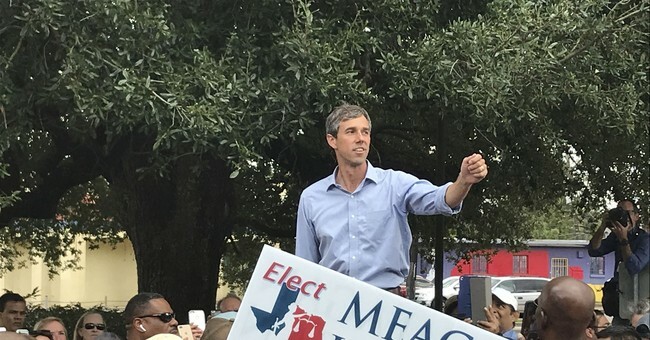 If O’Rourke had lost a Senate seat from South Dakota, it is very doubtful that Beto-mania would even exist. For now, O’Rourke is the brightest of the newest shiny objects. And what about his presidential qualifications? Well, he has none — “so what!” The current president, elected to office with zero political credentials changed all that forever. Besides, Beto had six-years more time in Congress than Trump, you can hear Democrats saying. "Andrew Gillum met with former President Barack Obama in Washington on Tuesday, two sources familiar with the matter tell CNN, amid ongoing speculation that the former Democratic nominee for Florida governor might be considering a potential 2020 presidential bid." To Gillum’s credit, he lost by only 33,000 votes to former Rep. Ron DeSantis, a Trump acolyte. That feat qualifies Gillum to appear on every Democratic nominee’s VP shortlist — not because he has any experience to be one heartbeat away from the presidency —but because he carries the potential to help win Florida’s 29 electoral votes. No experience, no problem! What matters is an O’Rourke/Gillum ticket with two young liberals, 180 degrees away from President Trump, might have a decent shot of winning a combined 67 electoral votes — nearly 25 percent of the 270 needed to win the White House. Democrats could be dreaming about the largest red state and the largest swing state both landing in the blue column on election night 2020. It’s the future they say. What’s not to like? New fresh young faces almost winning races.